DRIVE presentation at ESCAIDE: Seasonal flu vaccines come in multiple flavours: DRIVE wants to know, which brands are used and where? Seasonal flu vaccines available in Europe come in multiple flavours: they protect against 3 or 4 virus strains, they can be inactivated or live attenuated, and may or may not contain an adjuvant… on top of this, several brands of each flavour may exist. DRIVE aims to estimate vaccine effectiveness for the flu vaccine brands used in Europe. To this end, we would like to know: which vaccine brands are used where? What might be seen as quite a simple question, surprisingly doesn’t have an easily accessible answer. We started by looking at vaccine procurement systems in 14 European countries. How do the vaccines arrive from the manufactures to the population – are they bought by health authorities or does the local general practitioner (GP) or pharmacist decide which vaccines to buy? How does this affect the number of brands that will be available in a population? Is it possible to know well before the yearly flu shot campaigns start which vaccines will be used where? To answer these questions we conducted interviews with experts on flu vaccine procurement from public health institutions and manufacturers. 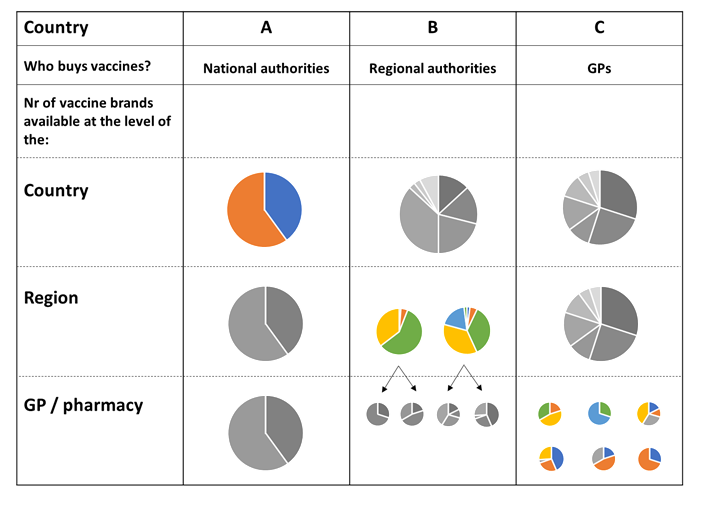 Finally, we want to know: can knowledge on these processes help DRIVE to determine where to set up studies so that vaccine effectiveness can be obtained for all the different vaccine brands? Come to find out at ESCAIDE! Track 23: Policy approaches and evaluation C23.6. Ulrike is currently a member of DRIVE consortium and will be giving this year presentations on Finnish register-based cohort studies in influenza vaccine effectiveness. Acknowledgement: This project has received funding from the Innovative Medicines Initiative 2 Joint Undertaking under grant agreement No 777363. This Joint Undertaking receives support from the European Union’s Horizon 2020 research and innovation programme and EFPIA. Disclaimer: This website reflects only the author’s views and neither IMI nor the European Commission is liable for any use that may be made of the information contained therein.